Distinguished panelists to consider the ethical implications impacting practicing lawyers as they, their clients, and courts face the accelerating adoption of artificial intelligence. With the sweeping ascent of AI, we come face to face with a critical question: to what extent should society delegate to machines decisions that affect people? 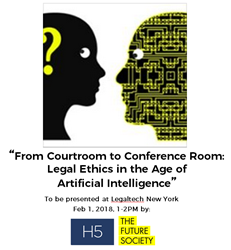 H5, a leading provider of eDiscovery and technology-assisted review services, today announced that the company will exhibit at the 2018 Legaltech® Tradeshow in New York and will also present a panel discussion entitled “From Courtroom to Conference Room: Legal Ethics in the Age of Artificial Intelligence.” The panel will be co-presented by The Future Society at Harvard Kennedy School and will be moderated by noted New York University professor and legal scholar, Arthur R. Miller. The Legaltech Tradeshow, part of Legalweek New York, will be held at the New York Hilton from January 30th through February 1st. The panel, open to all conference attendees, will take place on February 1st at 1PM. Complimentary passes are available, and one CLE ethics credit may be obtained. The distinguished panelists, including the Honorable Joy Flowers Conti, Chief District Judge, Western District of Pennsylvania; Anthony E. Davis, Partner, Hinshaw & Culbertson LLP; Amy Mushahwar, Partner, Davis Wright Tremaine LLP; Nicolas Economou, H5 CEO and Chair of The Future Society's Science, Law and Society Initiative; and Julia Brickell, Executive Managing Director and General Counsel, H5, will consider how practicing attorneys are affected as they, their clients, and the courts face the myriad ethical implications that arise when decisions that affect humans are delegated to machines. The panel will draw on guidance provided by the ABA Model Rules and will discuss viewpoints of prominent think tanks, academics and standards-setting bodies. H5 will also be presenting demonstrations of the company's Relativity Innovation Award-winning product, H5 Matter Intelligence℠ and H5 Matter Analytics.These applications provide H5’s clients with powerful, real-time resource management, collaboration tools, and direct access to billing and project analytics that users need to make well-informed decisions by and across matters. H5 is a leading provider of eDiscovery and technology-assisted review services. With expertise in all aspects of the eDiscovery process, H5 excels at managing and delivering processing, hosting and related services. In addition, H5 is dedicated to finding information that clients need to win cases, meet regulatory requirements and address risks before they become liabilities. By combining advanced technologies with expertise in search and information analysis, H5 delivers customized solutions to help corporations and law firms meet their litigation discovery, legal compliance and information management objectives. Numerous independent studies have demonstrated that H5's approach delivers more accurate results and greater cost savings than other alternatives. Please contact info(at)h5(dot)com for more information or visit our website at http://www.h5.com.